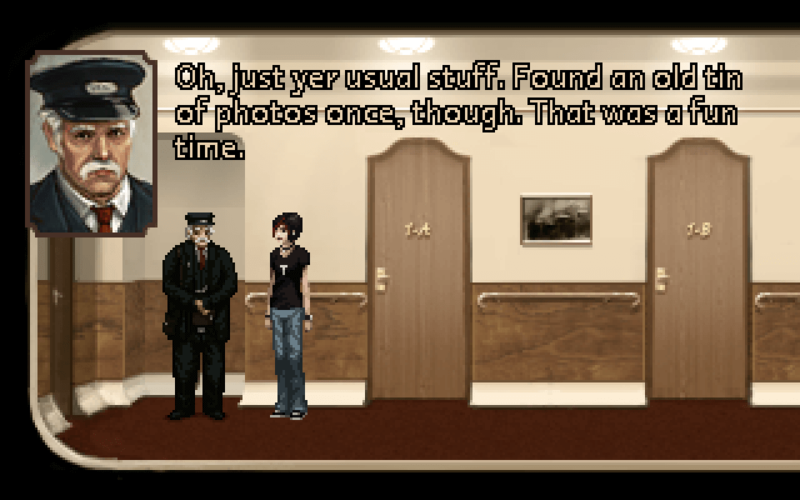 Reviewing a game like The Charnel House Trilogy is difficult because it is not really a game. You do some game things, like click on things in the environment in order to move. 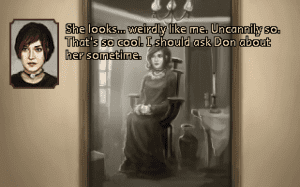 However, The Charnel House Trilogy is more an interactive story. As far as I can tell, your actions have no impact on the story whatsoever. This is not a Telltale adventure game where players can get unique dialogue and story options depending on how they play. There is only one way to advance, and it will wait for you to get there. Luckily, the game’s story is compelling; I found myself eagerly moving forward to try to figure out what was happening. 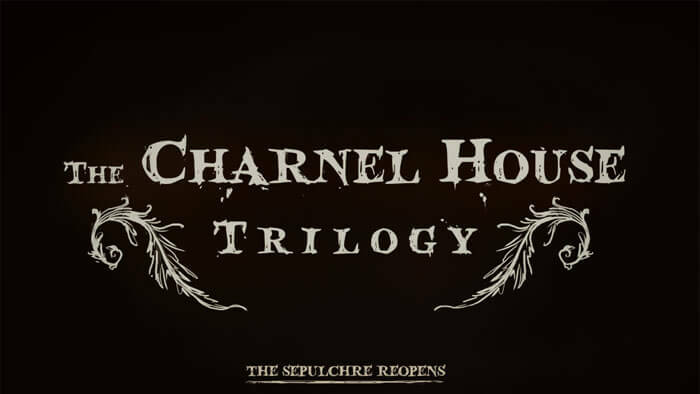 A few (mostly production related) things mar an otherwise enjoyable experience, but The Charnel House Trilogy receives a hesitant recommendation if you are a fan of tense, atmospheric horror. Any excuse to talk to Don is a good one. The Charnel House Trilogy consists of three short stories that revolve around two main characters. It tends to draw its horror from some well known psychological and slow-burn pop culture staples: Stanley Kubrick’s The Shining, shows like The Outer Limits and the Twilight Zone, and some of the works of Edgar Allen Poe. The three episodes, which are entitled Inhale, Sepulchre, and Exhale, do an excellent job of keeping the player drawn in and unsettled. Right from the outset, things just seem a bit out of place. As the story continues, things begin to unravel more and more. The story eventually reaches a disturbing climax that works well, although it seems a bit over-the-top through too critical an eye. The story is fascinating and interesting – predictable enough that you want to see if you are right with your guesses, but out there enough so that you are never 100% sure what will happen next. In a game that is essentially a playable story, obviously the story is important. 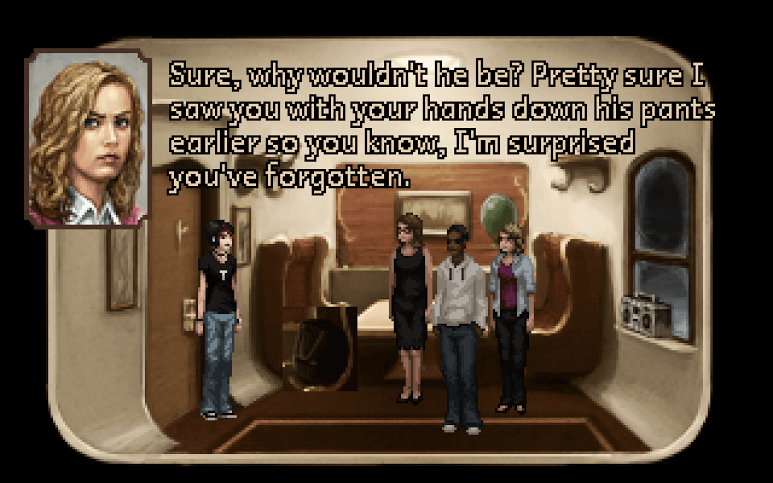 A few other factors limit what could have been an excellent, if minimalistic, adventure game. The most glaring is the voice over work. Why does it sound like you are talking through a PVC pipe? 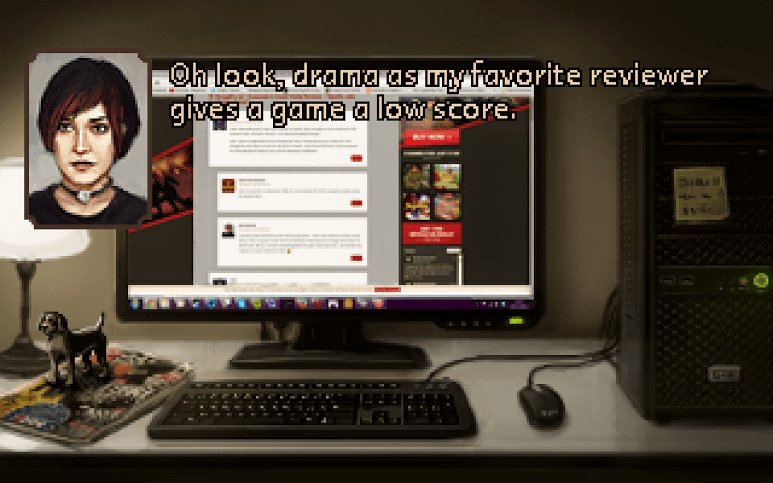 It is not just some hammy dialogue or actors with little to no experience (although the game suffers from those on occasion as well). For me, it was the inconsistency of the actual recordings that completely spoiled immersion for me. Some characters (specifically are main four) are obviously recorded with care: at least a solid microphone, if not a full studio experience. As soon as you start encountering minor characters, it sounds like they were recorded from across the room with a Rock Band microphone. It is not awful when a character just says one thing, but a conversation between two characters, one with a good recording and one with a bad, was incredibly distracting and easily fixable. No dialogue. My kinda scene. The other thing hampering The Charnel House Trilogy is the length. It is an inexpensive game, but I easily played through in one session. My official Steam time played is 1.7 hours, and that is just the time the game is open – bathroom breaks, snack breaks, or Alt-tabbing so you can buy more AdVenture Capitalist lemonade stands would still add to your total time. That means this game easily clocked in for me at under 90 minutes. Considering the lack of replay value (unless you want to go back for the few achievements you may have missed), I felt like there just was not enough to this game. Game length is not everything, and there is something to be said for a game telling its story and not overstaying its welcome, but this one seems like it is over just a little too quickly. That may also be because the puzzle elements of the game are not really puzzles. 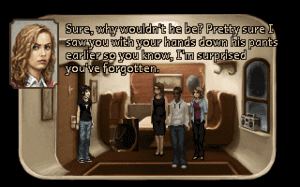 The only time I found myself “stuck” in The Charnel House Trilogy was at the very beginning when I was still acclimating myself to the controls and movement. Generally, the player follows directions from one point to the next and then opens up the next part of the story. I am not criticizing this style of game, but I just wish there was more. 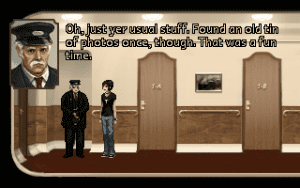 All this being said, The Charnel House Trilogy does have plenty of good going for it. Some of the voice acting is quite good. I was especially impressed with Don, the seemingly jovial conductor of the train. 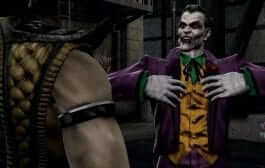 He is just odd enough that you know he is hiding something, but his upbeat Scottish accent made him feel like the most likable and fleshed-out character in the game. The game does an excellent job of being unsettling, with some great use of quick visuals and eerie sound effects throughout. Noteworthy here is a high-pitched, constant discord that plays just under the background noise whenever something strange is happening. It literally made me squirm in my seat. That does sound like a fun time, Don. This is not a “jump out and scream at you” horror game. It is a slow burn; constantly unsettling you and making you question what you are seeing and hearing. I found myself picking apart every line of dialogue, searching for clues as to who these people truly were and what their plans were. Sometimes I found myself questioning whether everything the characters experience is truly happening. 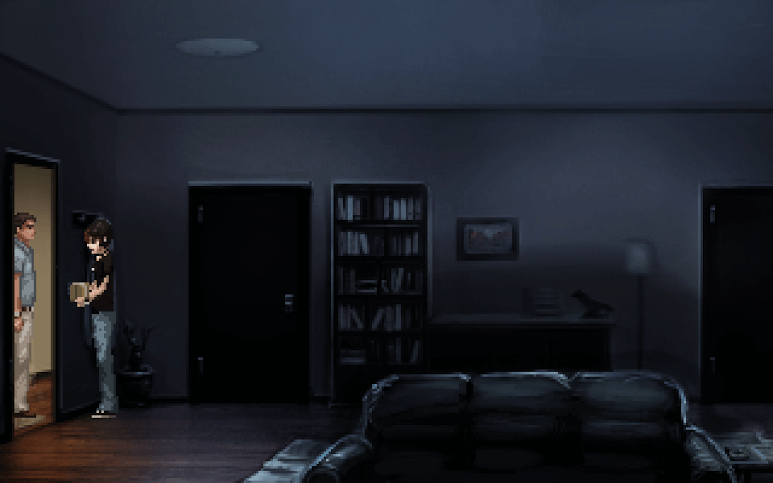 While the psychological horror works well, the game’s attempts at humor are a mixed bag. The first episode in particular, titled Inhale, has several odd, fourth-wall breaking jokes. Alex, the playable character in this episode, makes references to odd adventure game tropes, bad review scores, and the pointlessness of fetch quests. It would work for me better if the rest of the game shared a similar style, but her Darya-esque deadpan quips tended to grow stale, especially as they did not at all match the unsettling tone of the other two episodes (at one point she claims to find a twelve foot ladder hidden under a lampshade, for example). I see what you did there, Alex. As stated before, it is tough to know whether or not to recommend it. 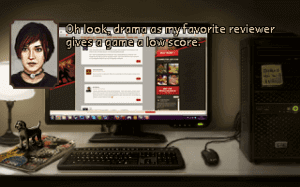 As an interesting playable horror story, it works well. The subdued soundtrack adds to the atmosphere, and the retro art style brings back memories of the classic adventure games of yore (although you probably do not want to play it full screen – some images can be so pixelated it is difficult to make out what they are). On the other hand, it is just a story – hardly a game at all. On top of that, it is a short story with some odd production and style elements that do not quite gel with the rest of the package. If you’re craving an inexpensive, short horror story, this might be a good place to look. If slow-burn horror or visual novels are not your cup of tea, you may want to leave this train at the station. What did you think about The Charnel House Trilogy? Did the story sufficiently creep you out? 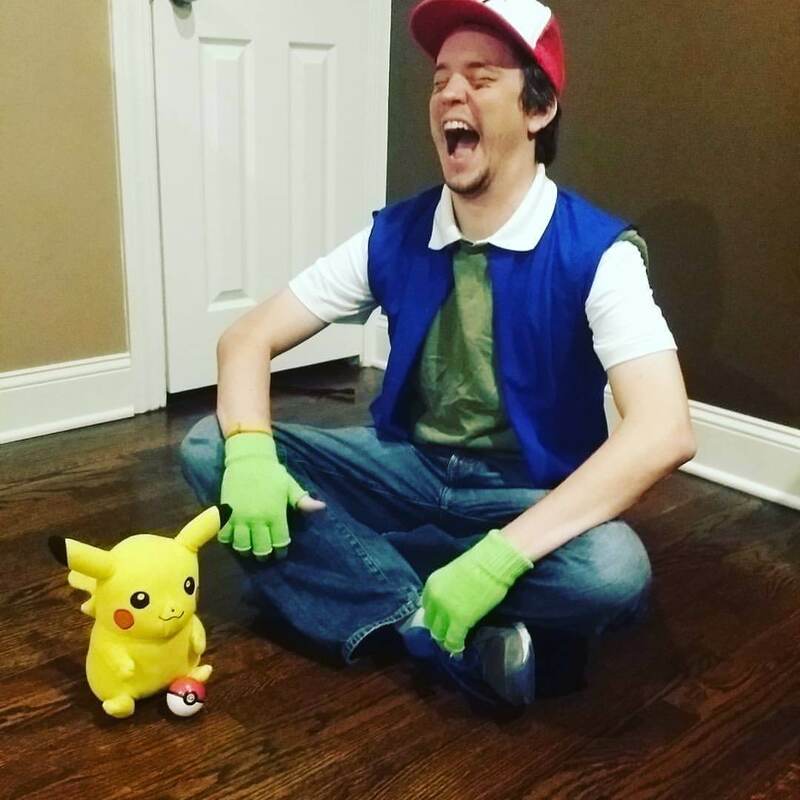 Or did the less successful elements ruin the experience for you? Let us know in the comments below! Atmospheric horror... in a teeny-tiny package. 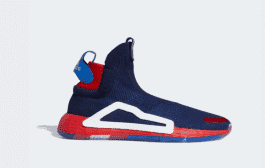 Succeeds on some fronts, but ultimately fails on too many.